Posted on October 6, 2017 at 4:36 pm. 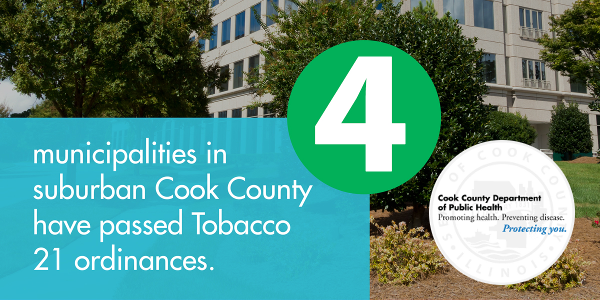 Cook County Department of Public Health has created a webpage for their Tobacco 21 initiatives. They highlight the benefits of raising the Minimum Legal Sales Age and provide other useful resources. CCDPH created a useful factsheet, multiple social media posts, and a creative infographic to use in your local T21 efforts, whether they are in Cook County or another locality. The Cook County Department of Public Health is also promoting their Healthy HotSpot initiative. Healthy HotSpot is a community partnership between CCDPH and multiple organizational partners. Healthy HotSpot includes natural areas, schools, local businesses, faith based communities, healthcare providers, and more. A useful map has been created to show what areas in Cook County are included in these different categories of the Healthy HotSpot initiative. Many of the categories include tobacco control measures, focusing on smoke-free areas and increasing the minimum legal sales age. This webpage is a valuable resource for advocates looking to expand the impact of T21 in Cook County and beyond. Currently, there are 4 localities in Cook County that have passed a T21 ordinance. Check out our locality list to see what communities in your state have raised the sales age. We urge everyone to take a look at the CCDPH’s great work at the link below!